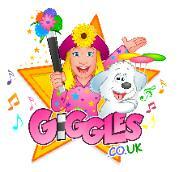 Giggles Parties for kids, imaginary singalong parties. and will soon have the Birthday Child and friends Giggling as they arrive! eager volunteers and loads of prizes ! children as they participate in her fun activities. balloon hats for the birthday child, and all the guests ! Oh boo hoo! Before you know it, they'll be Giggling all the way home! effortlessly blend into a family centred occasion. all "a party full of Giggles!" Add some Giggles entertainment to your event.